We carried on with the tidying up and modifying of our old mobile platform to convert it into a fixed platform in the AB corner of the roof so we can have access to this side of the roof and the Skylight while we are working up on top of the roof. 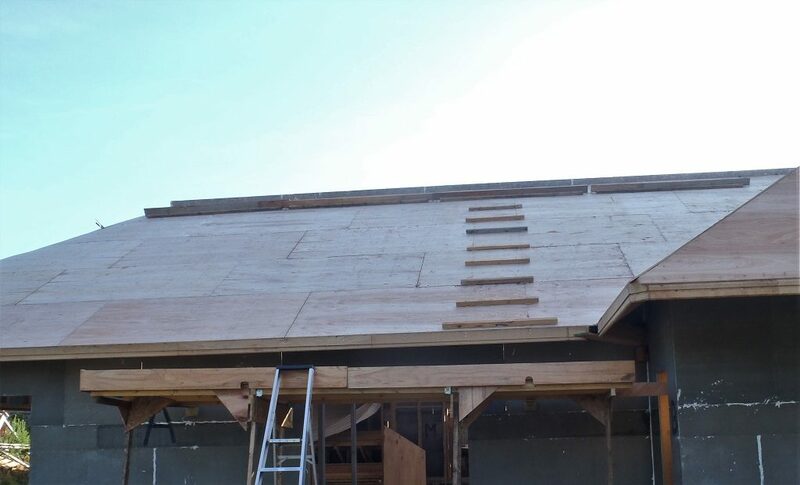 We also modified our foot rails to include an additional extra wide plywood strip to make the foot-rails more secure and somewhere we can put down tools as we work around the whole Skylight section down the middle of the roof. We have screwed down a ‘ladder’ on the roof to make getting up and down easy. We will carry on the preparation work tomorrow and then start sorting out and building some trestle tables to support the framework of the Skylight module down at ground level so we can assemble (and test) it so we can check out the design and implementation of the various parts including the aluminium glazing bars. We need to make a series of trestle tables to hold up this framework (it being about 15 metres long and 2.5 metres wide), plus also to paint the timber and have it all ready for installation when we are happy. Video Footage of the Entire Job of Covering Our Roof With Plywood Boards! Preparation Continues ..